Instant Pot Mexican Rice brings all the the flavor of your favorite Mexican restaurant right in your own home! This is the same rice that you find on the oval platter next to the refried beans when you order your favorite fajitas, burritos, enchiladas, etc. Light and fluffy Instant Pot Mexican Rice. 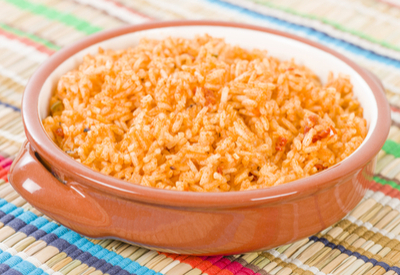 Mexican rice provides a burst of flavor when compared to standard white rice. The combination of onions and peppers with the crushed tomatoes and spices makes this a stand alone side dish. 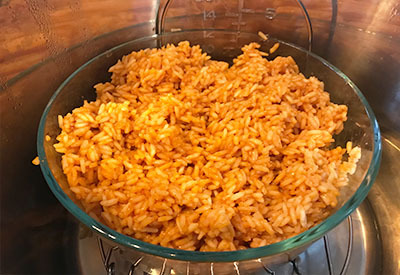 Instant Pot Mexican Rice gains the characteristic red color from both the tomatoes and the chili powder. 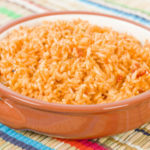 On the contrary, Spanish rice, but also sometimes referred to as Mexican rice, is more yellowish in color from the spice saffron. You can adjust the spice levels in the recipe to your preference. For instance, if you can handle a little heat, dice the entire jalapeno and add it to your dish. The heat from peppers originates in the seeds and ribs. If you remove them you will have less heat in your dish. 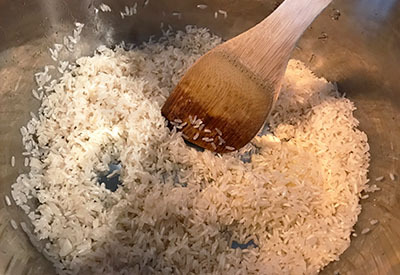 Making rice directly in your Instant Pot can be tricky. I have heard horror stories of individuals getting the dreaded BURN message on the display screen. I have also heard that the pot won’t seal but the timer begins to count down, falsely indicating that it is in cooking mode. Once you add the liquid be sure to scrape the bottom of the pot to remove any stuck items. There are a few of reasons that these errors occur. First of all, make sure that you add enough olive oil and you saute the rice prior to cooking. This helps ‘pre-cook’ long grain rice prior to pressure cooking and seasons the pot to prevent sticking. Second, be sure to add enough liquid to the pot. Not enough liquid will almost guarantee the burn message will appear. Scrap the bottom of the liner to clear any stuck materials. Once you add your liquid, be sure to remove any debris that is stuck on the bottom of the pot. If you don’t, it won’t come to pressure. Finally, this isn’t the time for thick crushed tomatoes. The thicker the crushed tomatoes, the more likely you will receive the BURN message. 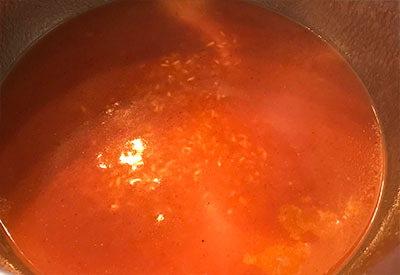 Use crushed tomatoes that are just that, crushed and have produced a lot of liquid. I have never had a problem with this recipe giving me the burn notice or not coming to pressure. However, if all else fails, use the Pot-in-Pot method. Some people prefer to make rice using the Pot in Pot method. After you have completed the saute mode, remove contents into a bowl that can fit into your Instant Pot. (I use pyrex or corningware bowls). Place the trivet in the bottom of the liner and fill it with 1 cup of water. Add the remaining ingredients to the bowl and place on the trivet. Proceed to cook as instructed. Light and fluffy rice flavored with garlic, onions, tomatoes and hot peppers. Perfect side dish for any meal! Place your Instant Pot on the sauté mode. Once the pan is hot, add the oil. Once the oil is hot add the diced onions and jalapenos (optional). Sauté onions until softened, about 4 minutes. Add the rice to the onions and sauté for 3 minutes, stirring frequently. Add the garlic, stir and sauté for one minute. Add the stock, tomatoes, cumin, and chili powder. Stir and scrape the bottom of the pot to make sure nothing is sticking. Press the Cancel button. Lock lid in place and place in the sealing position. Pressure cook/manual on high pressure for 8 minutes. Allow for natural pressure release for 10 minutes. Release any remaining pressure. Stir in the cilantro and season to taste with salt and pepper.